Each week, Big Issues focuses on a newly released comic-book issue of significance. This week, it’s Wonder Woman #22. Written by Brian Azzarello (100 Bullets, Spaceman) and drawn by Cliff Chiang (Human Target, Green Arrow And Black Canary), it takes Wonder Woman to New Genesis to showcase how this book applies a fresh look at past concepts. Wonder Woman is one of those great comic-book characters who has roots in two different realms: superheroes and mythology. The superhero genre is already a type of contemporary mythology, but Wonder Woman’s connection to the Greek gods opens up the types of stories that are possible with the character. She’s not alone in this regard—Marvel has superheroes Hercules and Thor representing the Greek and Norse pantheons—but writer Brian Azzarello has emphasized Diana’s mythological connection to set her apart from DC’s other heroes. The first thing he did was change the character’s origin, turning her into the biological daughter of Zeus and Amazonian queen Hippolyta rather than a lump of clay made flesh. Now the deities of Mount Olympus are Diana’s relatives, complete with all the complications that family brings. The absence of patriarch Zeus has ignited a battle for ruling power among the gods, a war that seems to have been won by the First Born, Zeus and Hera’s first child who was buried deep beneath the earth millennia ago. When Zeus heard a prophecy detailing how the First Born would assume total control over Olympus, he ordered the baby killed, but the infant was spared and buried underground instead, forced to fight his way to the surface over thousands of years. The First Born’s predicament highlights the two big elements of Greek mythology that have been the driving force of this series: prophecy and family drama. Diana’s primary role is protector of Zeke, the child sired by Zeus and the young human Zola. Zeke is prophesied to kill a god and take the throne of Olympus when he grows up, but Diana refuses to let her bloodthirsty relatives get their hands on the baby. 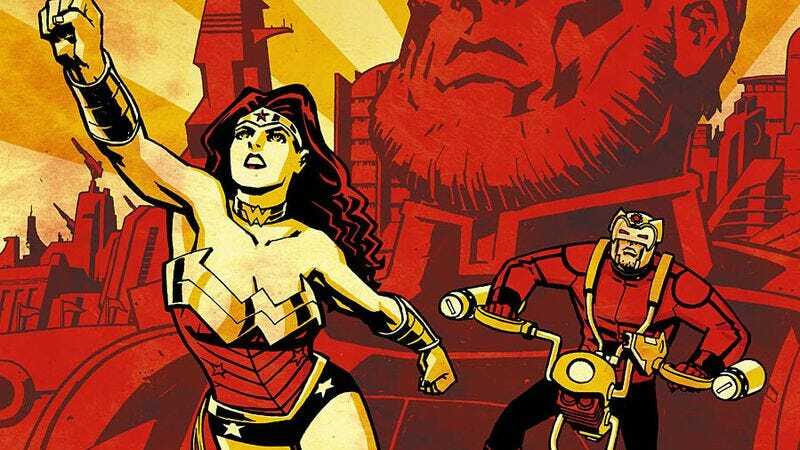 Wonder Woman’s story has been wrapped up in the drama of the old gods, but over the past year, Azzarello has begun to introduce Jack Kirby’s New Gods to the plot, starting with chauvinistic brawler Orion. The son of Apokolips’ tyrant Darkseid who was traded to New Genesis’ Highfather as part of a diplomatic compromise between the two planets, Orion was raised in paradise while the biological son of Highfather grew up in the hellish environment of Apokolips. It’s unclear how much of this pre-New 52 history is still in play, but it’s unlikely that Orion’s basic origin has been erased. The brash Orion has proven to be a great foil for Diana, and it’s unfortunate that she’s locked into a relationship with Superman elsewhere in the DCU because the sexual chemistry between her and Orion is off the charts. Azzarello has wisely chosen to completely ignore the Superman/Wonder Woman romance and has distanced Diana from any intimate affairs, keeping the focus on how strong Wonder Woman can be on her own. When Orion disrespects Diana in #19, she pulls him in for a surprise kiss, then grabs him by the balls and threatens to rip them off if he tries to get cheeky again. Their relationship has been primarily antagonistic up to this point, but this week’s #22 has Wonder Woman and Orion connecting on a personal level when she sees the hardened man show vulnerability upon returning home. At the end of last issue, Orion teleported Wonder Woman, Zola, Zeke, and goddess-turned-mortal Hera to New Genesis after the group took a massive beating at the hands of the First Born. Number 22 begins with Diana waking up from three days of healing, eager to learn where she is, who her rescuers are, and when she’ll get to go back home to continue her fight. It’s revealed that, like the rest of this book’s cast, Orion has some considerable daddy issues, and his father treats him like a servant at best, a dog at worst. Highfather may initially seem like the group’s savior, but his behavior toward his adopted son hints at his deeper malevolence. Highfather knows of the prophecy surrounding Zeke and isn’t willing to give up custody of someone who could potentially conquer them all, putting Orion in the difficult position of choosing between his father’s wishes and those of his new friends. Lucky for Diana, she’s able to sway Orion to her side by showing him the affection he’s denied by his adopted father. After being publicly shamed by Highfather, Orion retreats to the decimated planet below the floating utopia of New Genesis, where he tries to contain the rage and anger that is ingrained in his Apokoliptian nature. Orion’s emotional state is reflected in his physical appearance, and when he succumbs to fury because he fails to live up to his father’s perfection, he stops looking like Robert Redford and starts to resemble something closer to Mickey Rourke in Sin City. Diana is able to talk him down by helping him remember that perfection isn’t a reasonable goal, and that the best he can do is try to become a better person. Wonder Woman is a phenomenal fighter, but her greatest strength is her ability to inspire others. Her chat with Orion influences him to fight against his father, and he follows with Zeke in tow when Diana and the rest of her crew are boom-tubed back to Earth. The Jack Kirby influence continues to shine at the end of the issue when the gang of heroes returns to London to face the First Born and his army of jackal/human hybrids. These henchmen are a fun shout-out to Kirby’s Kamandi: The Last Boy On Earth, a Planet Of The Apes-inspired post-apocalyptic tale following the last human as he tries to survive in a world full of humanoid animals. Those last pages also mark the arrival of War to this storyline’s endgame, and the issue ends with a group shot that spotlights the ensemble cast Azzarello has built on this title. The pairing of Diana and Zola has been around since the beginning, but each new addition to their party alters the group dynamic in intriguing new ways. The first year ended with the villainous Hera stripped of her power and forced to live a life of a mortal, and Azzarello has been able to mine a lot of comedy from Hera’s fish-out-of-water situation as well as her budding friendship with her husband’s human mistress. Then there’s War, who has undergone a massive transformation from his pre-New 52 characterization. He’s no longer a devilishly handsome villain, but a weary old man who wanders the world with blood stains on his tan suit and a bottle of booze within arm’s reach. He’s also Diana’s mentor, and Azzarello has turned Ares into a far more intriguing figure by showing both the love and hate in his relationship with his protégé. Azzarello’s writing has revitalized Wonder Woman from a story perspective, but much of the book’s style comes from Cliff Chiang’s slick, graphic artwork. The covers for this series have been beautifully evocative images with high-contrast colors that make them stand out on the shelves, and Chiang’s cover for #22 is one of his strongest yet, taking inspiration from Soviet propaganda posters to foreshadow that New Genesis isn’t as bright and cheerful as it looks. (The backwards R in Wonder Woman is a great visual touch.) DC’s current house style is heavily influenced by the work of artists like David Finch and Jim Lee, creators who use a lot of cross-hatching in their work to bring a more realistic sense of texture to their art, but the visuals on Wonder Woman make a strong case for simplification. Chiang, along with fill-in artists Tony Akins and Goran Sudzuka, use a more controlled line akin to animation, where extraneous lines get in the way of creating realistic motion between individual cells. Texture isn’t created by the numbers of lines, but by the thickness of each ink stroke, creating a clean look that has the dynamic action and expressive characters of a cartoon. Chiang is the perfect artist to interpret Kirby’s larger-than-life deities for The New 52, and he’s able to retain the spectacle of Kirby’s work while applying a more contemporary design sense. Racing uniforms influence Orion’s costume, and Highfather’s brightly colored suit of armor is a more militaristic look than the flowing fabric of Kirby’s interpretation. Matt Wilson’s colors make Chiang’s art look even more retro by primarily limiting the palette to shades of red and blue, hot and cold hues that battle it out on the page. During the scene where Orion has to choose between Diana and his father, the icy blue of Highfather’s control room competes with the burning red of the boom tube, reflecting through color the conflict within Orion. When characters travel through a boom tube, the word “BOOOM” takes over the panel in bright red letters as the image switches to black and white, capturing not just the massive sound of the teleportation device but the blinding light that accompanies it. In both the linework and the coloring, there’s a conscious effort to not overcomplicate things, resulting in streamlined visuals that perfectly serve the needs of the story. Wonder Woman is the most focused, confident, and consistent title of The New 52, and as the story expands in scope to include the New Gods, the writing and art are only getting stronger.